"A Great Catalog Release From Mill Creek!" The "Ernest" films were watched frequently in my childhood. I had a VHS tape of Ernest Scared Stupid that I had watched constantly throughout the years. Jim Varney is Ernest, the "Great Redneck Hope" in this family themed horror film. Ernest awakens an ancient troll hellbent on kidnapping children and turning them into wooden dolls. After he collects five, he can bring about his evil army to destroy the world. Seeing this constantly as a child, this film means a lot to me. 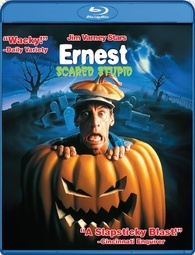 It's a great blend of horror-comedy with Jim Varney as the bumbling Ernest. It's not perfect, as you can crack a lot of jokes about the film. Like; why do none of the parents want Ernest near the kids? That comes up a lot in the film with no real reason why. I mean, has Ernest met Chris Hansen? With To Catch a Predator jokes aside, the film is pretty entertaining, especially with the visual effects of how the trolls look. Our main trill, Trantor looks frightening that might be a little much for smaller children. I give the film a 4.5/5. Mill Creek has given Ernest Scared Stupid a fantastic visual presentation. Presented in 1080p with a 1.78:1 aspect ratio, the film is near perfection. The only real problem is print damage which pops up here and there. Also, there's a scene where there's some discoloration on the right side of the screen towards the end of the film. Other than that, for a film that is over twenty years old, this is the best it will ever look. 4.5/5. Mill Creek gives us a basic Dolby Digital 2.0 audio track for Ernest Scared Stupid.It would have been perfect if it had a DTS-HD MA 5.1 track, but we can only dream. The audio track itself is average, leaving you for more out of this release. 2.5/5. Despite the bad audio and no extras, Mill Creek has given us a great visual presentation on Ernest Scared Stupid. And the great thing is that you can get this release for $1 at Dollar Tree! I give this release a 3/5 and I quite recommend it.